FxCraft MT4 Manual Trader is a convenient tool for manual trading on the most popular Forex platform – MetaTrader 4. Now the tool available in new lower price! FxCraft MT4 Manual Trader facilitates and accelerates execution of many standard actions, which often take our precious time and increase the chances of making mistakes. 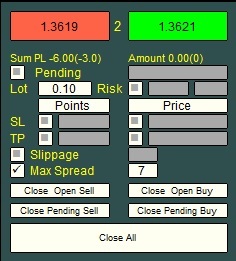 The product enables one click trading by mouse or by keyboard shortcuts (@ Market and pending orders). To place an order, click the green or red button or use the defined keyboard shortcut. If the ‘Pending’ box is checked, your pending order will be placed with the activation price equal to the value of the nearest box. The application automatically detects what type your pending order should be (STOP or LIMIT), depending on the location of a current price in relation to the entered price. Automatically set stop loss and take profit on selected levels. The values of stop loss and take profit can be given in points, or as a set price. It is also possible to disable this option. Constant or dynamically calculated lot size. To enable the calculation of the size of the position based on the percentage of capital select the “Risk” box. Position size is the maximum size for which maximal loss cannot exceed given percentage of capital. The ability to set “Slippage” for each position. In Manual Trader the functionality of FxCraft Visual Order Editor (easy and intuitive position management by dragging the entry, SL or TP level lines on the chart) is included. See FxCraft Visual Order Editor for more details. The “magic” parameter is used to define orders to be handled by an instance of the program. One instance will serve only those orders for the instrument, which opened with a given “magic”. To handle order which were manually opened set parameter magic to 0. Application FxCraft MT4 Manual Trader works only on the currency pair on which it was launched. Total profit/loss (“Sum P/L”) in the account currency, and next in parentheses in pips. If there is more than one open position we calculate the breakeven level. Value of Total profit/loss is distance beetween breakeven level and current price. Both values take into account commissions. 6 – close all sell orders. In order to properly install the Application please copy EA (FxCraftMT4ManualTrader file) to MT4_Directory/MQL4/Experts and copy FxCraftMT4ManualTrader.dll file to MT4_Directory/MQL4/Libraries. I would like to add my own functionality to FxCraft MT4 Manual Trader. Is this possible?